A long-running partnership with Movidius gives clues about where Google and virtual reality are going. Google’s virtual reality plans may include more than just headsets with smartphones inside. Citing unnamed sources, the Wall Street Journal reports that Google is working on a standalone VR headset that doesn’t connect with a PC or rely on a smartphone. The idea would be to occupy a middle ground between devices like Samsung’s Gear VR, which uses a smartphone for the display and processing power, and Facebook’s Oculus Rift, which must be tethered to a high-end PC. Google is reportedly partnering with machine vision company Movidius on the project, an interesting tidbit given that the two companies worked together on Google’s Project Tango phones and tablets. These devices use outward-facing cameras to detect and digitize their surroundings—something that has obvious applications for virtual and augmented reality. This effort is reportedly separate from the phone-based VR headset that Google also may be working on. Last week, the Financial Times reported that Google is working on a successor to existing Google Cardboard headsets—with solid plastic instead of flimsy cardboard containers—alongside a VR-optimized version of Android. Google could reveal this project during its I/O developers conference in May. The standalone headset, meanwhile, is still in its early planning stages according to the Journal. It could arrive as early as this year, or it could be cancelled before seeing the light of day. 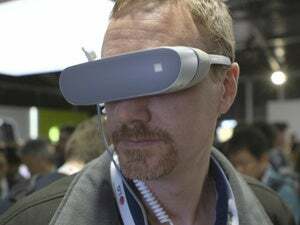 Why this matters: Although the Journal casts this rumored device as a VR headset, the mention of outward-facing cameras and motion tracking sounds like it might try to straddle the line between virtual and augmented reality. To achieve both, it’s unlikely that users will have all the necessary technology built into their smartphones, which may explain why Google is considering a standalone headset instead. Ditching the phone or PC connection is the natural endpoint for VR and AR anyway, and Google may have a hidden advantage if Movidius’ chips can sense the world around them without burning through battery life.